Saturday, May 5th - 6:30 - 9:30pm - at WISE Learning Center! Come celebrate with us over 15 Years of Service as we bring to you the wonderful Dr. Abdullah Hakim Quick who will speak to us about how the works of IslamInSpanish and its relevance to Al Andalus, Ancient Spain (781-1492) in the application of "Convivencia" in modern times. 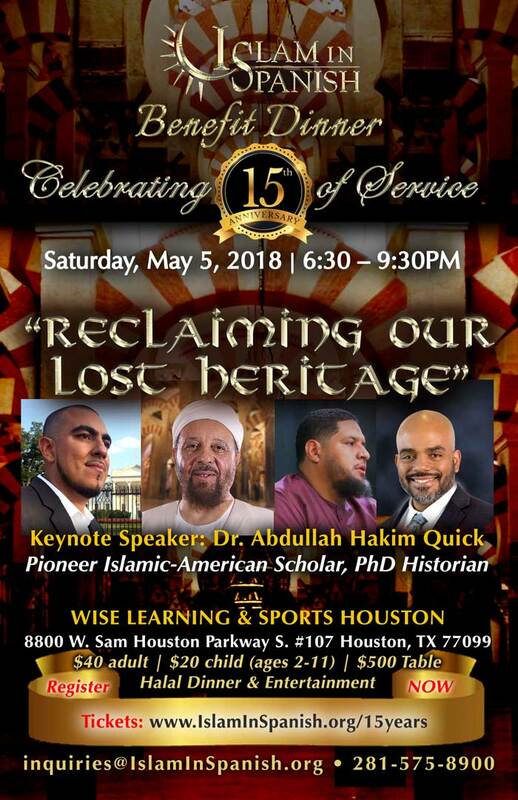 We will have a culturally rich program with diverse community leaders such as Jaime "Mujahid" Fletcher, Imam Isa Parada, Imam Wazir Ali and more, Live Interviews, Halal Latino Food, Inspirational Testimonies and much more! Don't Miss Out! Dr. Quick is a historian, social activist and religious leader of African and Native American descent. He has travelled to over 58 countries doing research and delivering lectures to various communities. His qualification in Islamic Studies comes from a BA from the Islamic University of Madinah, Saudi Arabia and his history background is shaped by an MA and PhD from the History Department of the University of Toronto, Canada.